Over the last couple of months or so, volatility has ruled the currency markets. Firstly, even though the US dollar (measured by the DXY index) had been strengthening since the summer, it really took off after the US election as bond yields rose sharply anticipating fiscal stimulus, firmer growth and inflation, and higher policy rates. At the same time, the Chinese currency came under renewed stress as reserves fell by US$70 billion a month in November, adding to the nervousness that was already present and manifesting itself in outflows averaging $4-50 billion a month over 2016. These two variables — the US dollar and the Chinese renminbi — are likely to be the key determinants of what happens to Asian currencies and rates in 2017. To that add commodity prices (though they are usually strongly – negatively – correlated with the dollar index). Besides that, the domestic situation is each country matters: The vulnerability of each country to potential outflows and the policy toolbox available to deal with it. Consider each of these variables in turn, recognizing the uncertainty around US policy at this time. For the US, there is a textbook case of currency strengthening with the expectation of tighter monetary and looser fiscal policy. Moreover, the divergence in monetary policy between the Fed and the BOJ is likely to continue. Similarly, the ECB is expected to stay with quantitative easing, even as the Fed raises rates, though the amount of monthly asset purchases is likely to lessen. For the Fed, while one can debate the magnitude and frequency of rate increases, it is clear that rates are going up. Moreover, there is an expectation of a rise in real yields, rather than a pure inflation compensation, which make the medium term case for dollar strength ever stronger. My expectation is for 2 to 3 rate increases this year and something similar next year, but the actual outcome will depend crucially on fiscal policy and hence comes with a fair amount of uncertainty. It is also clear that the BOJ is likely to stay with its current stance. Despite its upgrade of growth prospects, there is also a recognition that they may not reach the inflation target of 2% by 2018, which is near the end of Governor Kuroda’s term. Given the low yielding nature of the JPY, there may still be significant upside on the USD/JPY, especially if US fiscal stimulus is large and creates expectations of rising deficits and higher yields. The European outlook is less clear cut as inflation seems to be on the rise – in December, consumer prices in the Eurozone rose at 1.1%, and in Germany by 1.7%, both of them the fastest rate in three years. The ECB also signaled its intention to taper asset purchase, from €80 billion a month to €60 billion, starting April. Given the rise in German inflation, there is a real possibility that the authorities there may clamor for a more aggressive schedule. 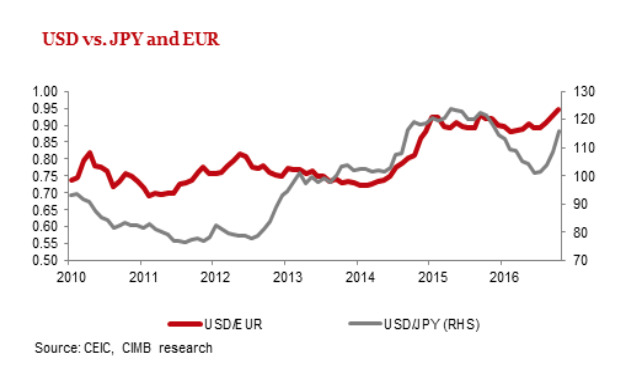 As such, while the USD should strengthen versus both the EUR and JPY, a larger movement versus the JPY is more likely. While this is a medium term outlook, in the short term, some element of consolidation in both US bond yields and the USD are likely. First, while the Fed has said that it will not implement policy on anticipated fiscal changes, some of the participants who make the SEP (Summary of Economic Projections) have greater fiscal expansion incorporated their forecasts. As this is expressed in the SEP, there is a reasonably good chance it is also discounted by the markets. Second, the statements from the Fed have been more hawkish than in the past. Without actually raising rates, it is difficult to see what else the Fed could do to raise bond yields in the near term. Third, there was a rise in bond yields post the OPEC meeting on November 30th where a commitment was made to restrict oil supply. Overall, there has been a general rally in commodity prices that is flying in the face of historical correlations. 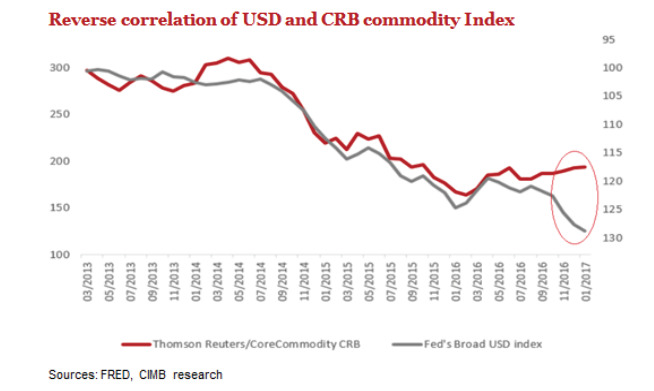 Typically, commodity prices and the USD share a strong negative correlation but this has broken down in recent times, largely due to demand from China. That demand, though, is quite likely not real demand as it is not justified by commodity intensive part – fixed asset investment – of Chinese growth. More likely it is speculative demand, as a real hedge against deprecation of the RMB. Either way, the USD and commodity prices should soon reassert their historical relationship. And there should be a consolidation in bond yields and the USD. The medium term outlook however remains for further dollar strength. I expect the USD to end 2107 at around 1.22 to the JPY and at parity to the EUR. As I’ve maintained for a long time that the RMB was likely to weaken under almost all circumstances. That position remains unchanged. I had highlighted the reasons in the previous section and they are summarized below. The Chinese story is of a structural slowdown being cushioned by fiscal stimulus and credit expansion. However, with credit-to-GDP perpetually increasing, this was an unsustainable situation. The key call was when China would shift emphasis from growth to dealing with the credit bubble. I think that we are close to that time. 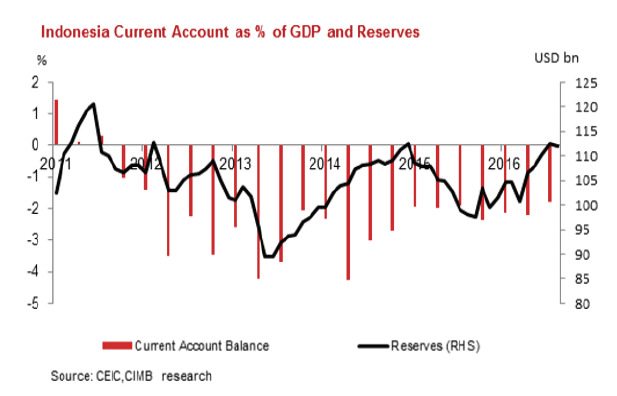 Despite growth holding steady, China has been steadily losing reserves in large numbers. That means that markets are looking beyond growth and hoping for some sign of financial stabilization. But, financial stabilization means deleveraging and hence lower domestic growth. Yet, at the same time, they cannot give up the ghost of growth, especially heading into the 19th Congress in the autumn. So fiscal policy, to the extent possible, will be simulative. And perhaps, more importantly, the currency will be kept weak to help exports. Given the current situation, and the markets’ change in emphasis away from growth to stabilization, the authorities have two choices. And under both scenarios, the RMB will be weak. If they still focus on credit-fueled growth and try and meet growth targets, the RMB will weaken as capital outflows are likely to increase. If they change focus to stabilization and deleverage, growth will suffer domestically. They would then like to keep the RMB weak by design to get the external sector help cushion that softening of domestic demand. I expect the RMB to be around 7.25 to the USD at the end of 2017. In the face of rising US yields, a stronger dollar, and a weaker RMB – affecting Asia in different ways – the standard response of Asian currencies will be to weaken versus the US dollar. The remainder of likely changes in Asian currency values will depend on how well they deal with the potential outflows that are triggered by higher US yields. If countries do not resort to controls, there are four main buffers to outflows: raising policy rates, increasing bond yields, weakening currencies, or using reserves. The extent to which other buffers can be used to weather outflows will determine how little or how much respective currencies will move. For example, the table below shows how Indonesia used all measures to cushion the impact of what were meaningful outflows from currency-account deficit countries during the taper tantrum in 2013. The extent to which each shock absorber can be used, depends on how much policy space exists around that variable. 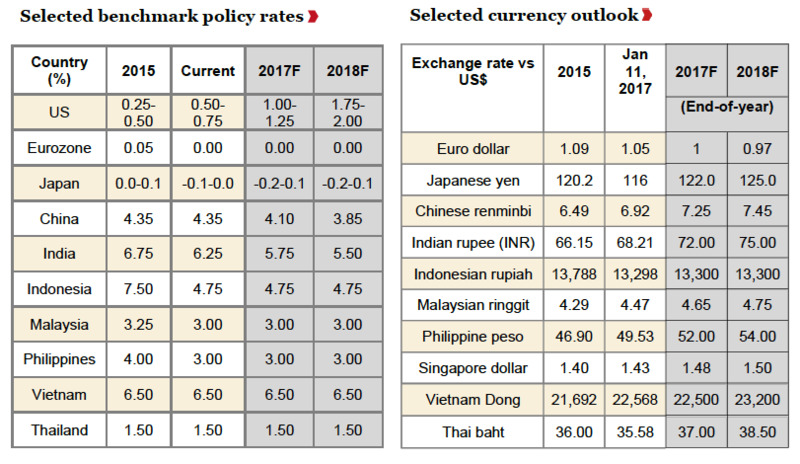 This time around, raising policy rates is not an option for countries, though short term rates are likely to go up in Singapore anyway. 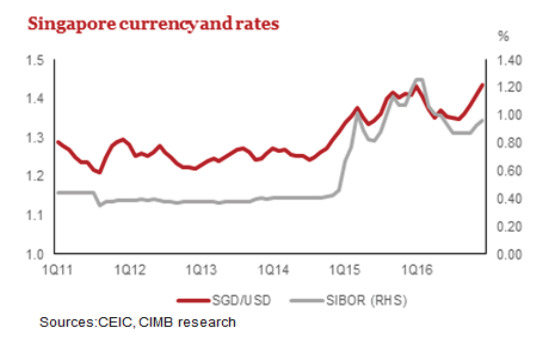 The Monetary Authority of Singapore (MAS) has the nominal effective exchange rate (NEER), which is the intermediate target for monetary policy and settings are currently in neutral. With policy in neutral, the SGD will move in tandem with its trading partners. As US rates rise, and the USD strengthens, the depreciation premium on the SGD is likely to increase, manifesting itself in higher rates. For the rest, it gets trickier. Consider Malaysia where the ringgit has been relatively weak since US rates started rising. 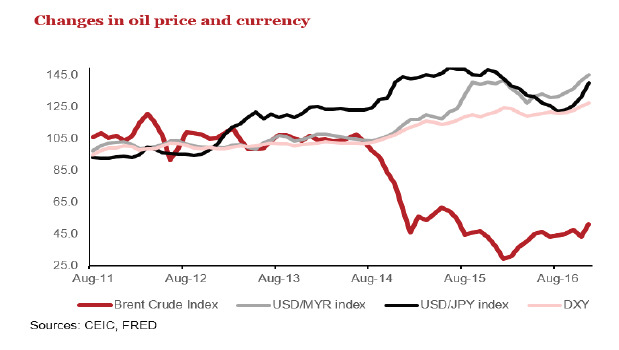 Typically, the MYR has tracked the dollar index (DXY; negative correlation) or oil prices (positive correlation). But, as the chart below shows, more recently the movement has been greater than that of the DXY while previously it moved perfectly in tandem. The JPY started weakening toward the end of 2012, but the MYR hardly moved then. It was only toward the end of 2014, when oil prices started declining (and the DXY started strengthening), that the MYR started weakening versus the USD. But still its movements (negatively) tracked the DXY; either by the same amount or by less. However, from the middle of 2015, movements have been greater than the DXY. That means that the MYR has been taking on more its usual share of the adjustment needed to counter a strengthening dollar. To a large extent, that has happened because the other 3 variables – policy rates, bond yields, reserves – have been constrained in how much they could adjust. With private domestic demand relatively weak, BNM could not raise policy rates. Indeed, in 2016, they cut rates once. Similarly, with high household debt, especially, in mortgages, households would be sensitive to rising bond yields. Moreover, there would be a risk of further outflows given the extent of foreign ownership in the bond market. 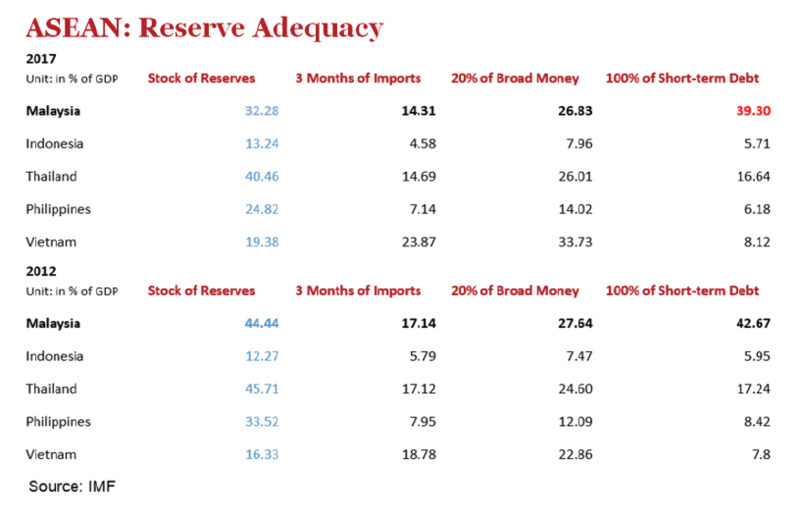 Reserves are adequate but as the table below shows, in terms of its relative adequacy, clearly the position was stronger is 2012 when the USD dollar started strengthening versus the JPY. At the end of 2012, reserves more than covered the variables highlighted by the IMF: trade, as captured by 3 months of imports; foreign obligations as captured by 100% of short term debt; and just in case locals starting getting out of the local currency, 20% of broad money. As such, even as the USD started strengthening versus the JPY, the MYR did not move. This time around the MYR has been under pressure as the other shock absorbers do not have much space. In the event of a serious shock that accelerates outflows they could perhaps be used more intensively, but for now there is no need for that. Exports are stabilizing, commodity prices are firmer, and the outlook is improving. 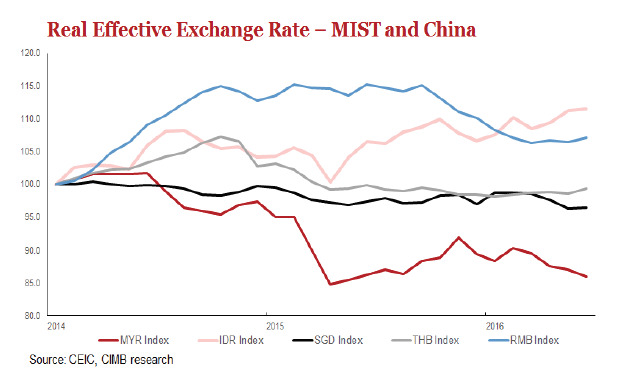 I expect a modest depreciation of the MYR is trade-weighted terms, largely keeping pace with RMB movements. Thailand may have the opposite problem. Even with rising rates abroad, a large and persistent current account surplus has meant that the reserve position is healthy. This is also borne out by the chart above where the stock of reserves is comfortably greater than what would be warranted by different risk metrics. In all likelihood, reserves will be used to deal with shocks and indeed they fell in November 2016. The currency is not under pressure and movements will largely come from policy decisions to keep exports competitive within the supply chain. Indonesia is probably the most interesting case. In the short term, there is likely to be some weakness as one would expect from most EM currencies running a current account deficit. 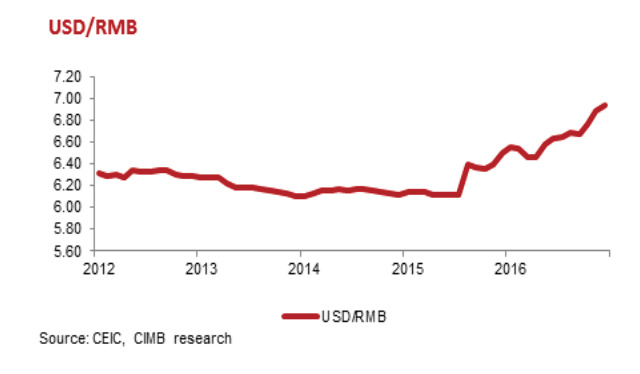 Yet, over the medium term, the IDR could possibly claw its way back despite a strengthening USD and weakening RMB. 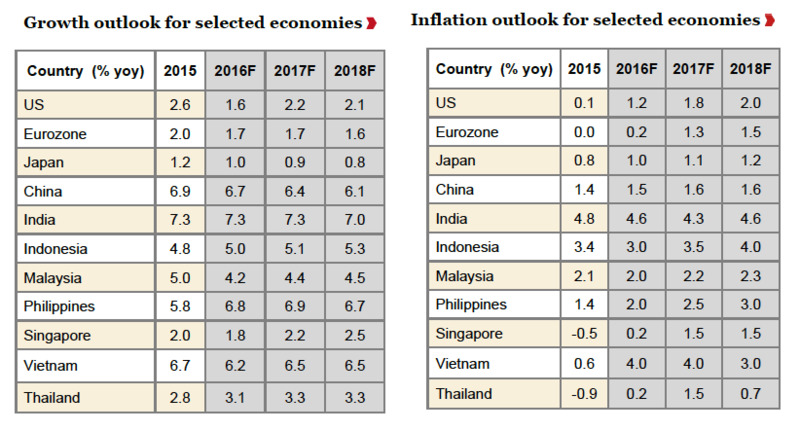 CIMB Niaga’s Chief Economist, Adrian Panggabean, makes the following case, expecting support from the capital account as a growing economy and high real rates attract both portfolio inflows and FDI. In the past two years, Indonesia has enjoyed a trade surplus of USD7.7 billion and USD8.4 (annualized 11M2016) in 2015 and 2016, respectively. As such, the country’s current account deficit has improved to 1.9% of GDP in 2016 (estimate; based on 9M2016 data) from 2.1% of GDP in 2015. Further, the capital account has been in surplus, thanks to ample FDI and portfolio investments. 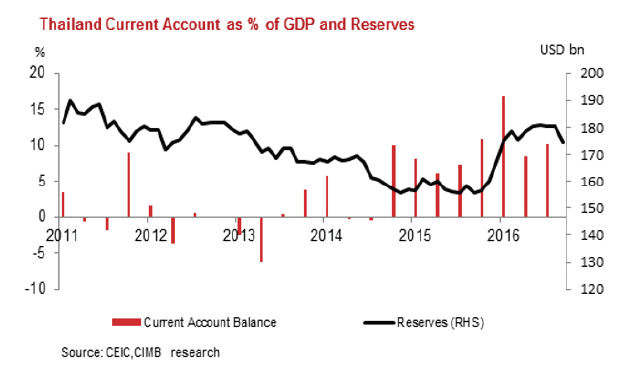 In 2015, the capital account surplus was 2% of GDP, thus offsetting the deficit in Indonesia’s current account. In 2016, capital account surplus is now estimated at 3.1% of GDP (based on 9M2016 data) against a current account deficit at 1.9% of GDP. Reserves have been supplemented through most of the year, with a slight drop in October and November. Portfolio flows into Indonesia are expected to remain strong in 2017. A resilient economy with improving growth prospects and continued reforms make Indonesia’s (already high) yield even more attractive. Further, firmer commodity prices provide another link between portfolio inflows, the prospect of realization of FDI, and the rupiah. The IDR is expected to average 13,450 with year-end outlook of 13,300 to the USD. At the end of the year, The SGD should be around 1.48, the MYR at 4.65, and the THB at 37. More detailed forecasts are on the next page.